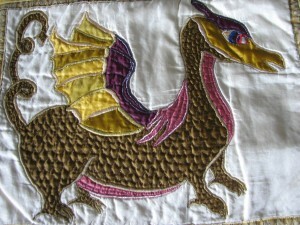 This technique enables you to work very accurate and detailed machine applique and it all starts on the reverse of your work. ‘Difficult’ materials, such as silk and satin become easily manageable and you will get to grips with working perfect satin stitch on your machine and add details with free machine embroidery. You may choose to work one of my designs, such as this friendly dragon, or to create your own but once you have mastered this technique anything is possible.